One of the things I enjoyed about this weekend was getting to spend some time with more of C's buddies. But you know how it is: for every buddy, there is always one hanger-on that is not really a buddy at all, that leaves everyone scratching their head and wondering who invited that guy?! While everyone was loading the truck, this guy was handing out his business card, offering free golf lessons to us all. He told me he normally charged $100/hour but would give me a lesson for free. I just politely took his card and moved on to another task. Later on, when the truck was being unloaded, he sauntered up to me and - I'm not joking - asked me if I was still cheering for the Tennessee Titans, or if I'd quit. I think I laughed so hard, it could be called a guffaw. I guffawed and told him no, I never had cheered for the Titans and maybe he had me mixed up with another one of C's girlfriends. He told me I sure did have some pretty eyes, and walked away. Remember that after the truck was unloaded, we went to a bar to celebrate with everyone. While were were there, I found out that not only had this guy asked me if I still cheered, but he asked not one other girl... not two other girls... not three other girls... not four other girls... but FIVE OTHER GIRLS - WITHIN TWO HOURS - if we still cheered for the Titans. That's six girls total. In two hours. All at the same bar. Which was not that big. A lesson to all you men out there, creepy or not: girls talk. And then we guffaw. And if the best pick up line you can use is asking the girl if she cheered for the Titans, e-mail me and I'll give you a new one that someone tried on Allison before the NKOTB concert and I am too much of a lady to repeat here. PS - He also suggested C organize a rugby tournament at Bonnaroo, and mentioned he is also a masseuse and a musician as well as a golf pro. This weekend I had the privilege of helping C with one of his pride and joys -- an annual collegiate rugby tournament he directs each March. 2000 people. 80+ teams. 8 fields. 2 days. I have tried to be very patient and supportive the past few weeks as lots of his time went towards this project. Turns out, that was easy to do once I started to see how much pride he takes in this tournament and how much he loves it, despite the stress and responsibility and massive phone bill each March. It's a HUGE undertaking that he and his teammates have put on every year (this was the 28th year). I got to see it all come together firsthand and learned so much, not only about rugby, but about C.
We watched the weather all week, trying not to let the rainy forecast ruin our spirits. I got there at about 8 am on Saturday. I sold merchandise all day, which was fun, because C happened to have designed it all... yet another skill of his. It warmed up some that afternoon and everyone was really enjoying themselves. The first day ends with a big on-site social, and that's exactly when the rain came. But the rain didn't stop the partying. It was close to what I imagine Woodstock looked like, except we had no music and drugs. The kids stayed until 8 pm when we had to literally shoo them away and encourage them to keep the party going downtown. The late rain + 2000 people walking around in it = a very muddy Sunday. I sold shirts again and did my best to stay warm, since it was low 40s and windy. I had on 2 t-shirts, a fleece hoodie, one of C's sweatshirts and my rain jacket. Eventually, after the trophies had been handed out and the teams had departed, it was time to clean up and break down. Some of the girlfriends/female volunteers had headed home for a shower and a nap. Meanwhile, I was out there with the men and a few of the women's team members, picking up trash like a convict, hauling tables and chairs... in my pearls, of course, and never breaking a sweat. Finally everything had been loaded up, put away in the storage shed and it was time to celebrate. We met up with about 25 other people for the post-celebration until we decided that we really wanted a hot dessert. Chili's famous Molten Lava Cake more than did the trick. All in all, a great weekend. Here we are afterward at the celebration... feeling as tired as we look, and no, I'm not holding him up, and why does my head look so big? C was the first to get there and the last to leave, both days. But as I told him, I love how even if he wasn't the one in charge, that would still have been the case. That's just the way he rolls. So selfless, such a trooper. He is the hardest working person I know. 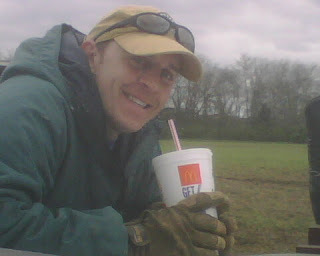 Pictured above: the greatest guy in Nashville, braving the cold while enjoying a fresh Coke from Mickey D's. Way to go, C! I am so, so, so proud of you. P.S. : I forgot to mention that dating the tournament director comes with some perks, including but not limited to: free food, free T-shirts and one of two free tickets to hear some band named Coldplay this summer. Which means the two tickets I'd already secretly bought for C for his birthday are for sale. Wow. I apologize to all of you who are noticing that this blog has been slacking a little bit. Things have been really busy here at work, which is usually what is going on when blogging isn't. We watched Role Models on Wednesday. It was really funny. Paul Rudd is so great. The guy next to me at work just fell out of his chair. He rolled backwards and just tipped right over. Talk about a Friday pick-me-up. Can you say "rural juror?" I can't. At all. Live Fully, Play Joyfully, Sleep Peacefully. I saw these words written on an artsy door hanger thingy in a shop recently. I forgot which shop. But I can't get this phrase out of my mind. Isn't it so simple yet beautiful? I might make my own artsy door hanger thingy. Just wanted to share some sunny words on a rainy day. Spring has sprung. You know how I can tell? All the little creepy crawlies are coming out to say hi. She wrote back and thanked me for my patience with this spring's "infestation." Red flag. Then she proceeded to tell me that my neighbor was having bug trouble and she needed to bug bomb my and her condo. Now I've had some bugs, I wouldn't say "bug trouble" because that makes me think of this. I have had "bug trouble" before and while I have killed some bugs so far this year, it's not as severe as I have been witness to (cough dorms cough). Therefore, I had to go home and clean my condo a bit/put away some perishables for the bug bomb, which was being detonated that afternoon at 2 pm with my blessing, since I wasn't coming home until past 10. So put yourself in my heels at almost 11 pm, criminally tired from my long but successful event, walking into my condo and seeing the effects of said bug bomb. Those things are serious. I picked up at least 20 nasty little bug corpses last night and another three this morning. It looked like the Titanic in there. Funnily enough, I am not sure this is the end of the bugs. Hopefully so, but I just don't trust that that bugs will ever go away for good. Linda J******* has added you as a friend. We need to confirm that you know Linda in order for you to be Friends on Facebook. Linda says "Will you be my friend!!!!!!!!!!!!!!!!!!!!!!!!!! I love you!" It's the end of the world as we know it, y'all. Don't say you weren't warned. As promised, I have another story about my "stalker" whom we will heretoafter refer to as Tom*. Very much not his name, but that's what we're calling him. I can't believe I haven't posted this until now but I guess I just forgot. So two Fridays ago, I am prepping for my event. 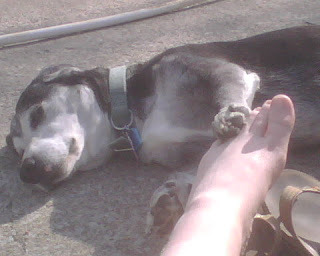 I kid you not that just that very day I had thought to myself that I guess "Tom" has gone away. Maybe he took the hint. I was rounding the corner of the building, and to what should my wondering eyes should appear? "Tom" of course, head to toe in camo, coming toward me like a freight train with the grin of a cheshire cat. Oh dear God. It was too late to turn away. "'Tom!'" I faked surprise. "What are you doing here?" Yes, that is a million-dollar bill with his mug in the middle that he made himself (check out those chompers). He made sure to point out his phone number was on the front AND the back, and he didn't want to call me at work because he knew I was so busy but that's how to reach him. I said yes, terrible busy - just like I am right now! See you later! And skipped away. Now - here's the creepster part. Later that night, I was chatting with security and some other folks, and they told me he'd been there at least twice before asking for me. Once was at night during an event (not mine so I wasn't there) and another time during the day when they told him I was in a meeting. And that day when he showed up in camo, he had asked a volunteer where I was an the volunteer literally pointed him in my direction! I think it's time I send him an e-mail and tell him while I appreciate his friendship, I can't take visitors at work so please stop coming by. Thoughts? If you are looking for a hamburger update, scroll to the bottom of the hamburger post. If you are looking for another story about my stalker, come back tomorrow. If you are looking for me, check under the mountain of paperwork at my desk! Sleep til 11? Check. Quite a feat for me these days believe it or not. Enjoy the lovely weather? Check. 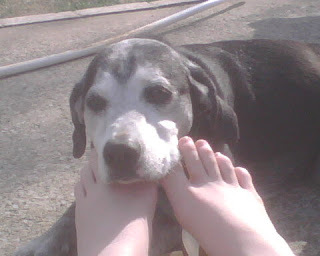 I sat outside on my crazy creek chair and read a book/served as a puppy headrest - meet Pete! Can't you just hear him begging me to pay attention to him? Put together a meal dictated not so much by recipes but by the weather/what I was craving? Check. We had pork tenderloin, butter beans and fresh grilled corn on the cob - I know, right? How good does that sound? It was great. I made the marinade from scratch, C handled the grilling and I put enough butter and sour cream in the butter beans until they tasted good. Success. I guess if you push the bird out of the nest, she will learn to fly. AKA, once again, I'm declaring it's time I learn to cook. Hope everyone's weekend was as lovely, weather is as gorgeous and day is as productive as mine. Dear Wendy's - you have met your match. Today I had some errands to run during lunch. I had to be back at work for a site visit at 1 pm, so I needed a quick lunch. I had chicken and turkey yesterday so I really wanted some beef. A hamburger. Wendy's to the rescue. I wait for 10 minutes, clearly speak my order into the box, enunciating just to be safe (you do it too), pay for my lunch and zoom back to work. I get to my desk and dive into my bag. I am unwrapping the burger when I see it: the tiniest sliver of cheese hanging off my burger. Oh. No. They. Didn't. It's no secret that I will eat cheese with anything, anywhere, anytime, any kind. Except one: hot cheese on a hamburger. Gross. Shudder. Ick. And now Wendy's has RUINED my lunch by putting cheese - AND MUSTARD, I just noticed - on my hamburgers. Even though I clearly said two junior hamburgers, ketchup only. I am livid! Should I pick it off like I always do? No. Throw it away? No. I'll tell you what I am doing. I am so angry about this that when I get off work today, I am taking these hours-old CHEESEburgers back to Wendy's and making them give me my $2 back. It's the principle of the thing. Their cashier had a button on that said No Problem. Well, turns out it IS a problem, because my lunch is screwed up and I am still hungry. How else are they supposed to learn? This has happened to me one too many times, Wendy's. Normally I pick it off, suffer through the mustard, angry at myself though not sure why I am at fault. But not today. Get ready, Wendy's on 21st. I'll see you at 5. 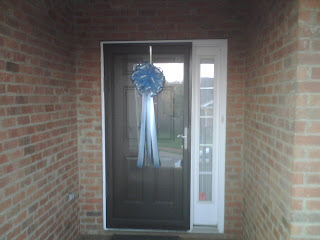 I picked that up yesterday from Michael's and put it on the new baby's front door. Doesn't it look pretty? Here's the best part - I paid for the bow, and I got a lesson for free! As my new BFF Judy was making it, she was showing me how she was doing it and telling me all the secrets. So the next bow (cough Kathryn) will be handmade. Know what will also be handmade? My two correct burgers from Wendy's that I am going to get later today. Stay tuned and I'll update with what happens. **Update: That was the least exciting exchange ever. Obviously, it was not the first time someone had saved her burgers all afternoon to bring them back in. I was in and out in three minutes with new burgers. I just got back from the hospital! Baby G was born this afternoon. I cried as soon as I saw him. And he's not even mine! I think I will always cry the first time I lay eyes on a friend's newborn baby. It's just so exciting, to meet the little person that has been cooped up in her tummy for 9 months, kicking back when you poke him. And how clear are those 3D ultrasounds? He looked so much like what that picture showed. Just in color, not black and white. Mary Thomas came on Sunday! She decided to quit playing games with the Katie and the doctor and now I am an "aunt!" Make sure you go check her out at Katie's blog and leave the proud mama and daddy a comment telling them what a beautiful baby they have! Baby G is still cooking. If he hasn't started coming on his own, they're going to smoke him out (aka induce) tomorrow morning at 5 am. I can't wait to meet him too! And just so my mother doesn't have to remind you all, of course none of these babies are my own. Y'all! The New Kids On the Block were AMAZING!!!! Allison and I had a fun day Monday running around town, eating yogurt, shopping and thinking of catchy things to write on our T-shirts and posters. In keeping with our tradition before concerts, we went and ate at a Mexican restaurant before the show. We strolled up Broadway before heading into the Sommet and taking our seats. The New Kids didn't go on until past 8:30 so there was a lot of people watching. I have NEVER seen so many women in one place in my entire life. It was crazy. And when the lights went down, people went NUTS. That was some intense screaming. It was just like 1990 all over again. The show was so great - high energy, high notes, it was like nothing had changed except the hair. They did six classic songs right off the bat - "Call it What You Want," "Favorite Girl," "Right Stuff," "Didn't I Blow Your Mind This Time", "Valentine Girl," "Please Don't Go Girl," and then a new one "Grown Man" and the hit "Games." Then they moved back to the back of the arena and sang some new and old songs around the piano like "Single," "Tonight" and some new ones. They came back up front and did some solos. Jordan did "Baby I Believe In You" and his solo single "Give It To You." Then Joey did a song I'd never heard and Donnie got to do "Cover Girl" all by himself. Then they all came out and did "I'll Be Loving You Forever" in lovely white attire and their new song "Click Click Click" which was catchy. They concluded with "Summertime" and went off stage. Just like we did in 1990, the audience screamed so loudly and the boys came back! They did an awesome, rowdy "Step by Step" and then left again. So we screamed again and sure enough, they came out in orange jerseys for "Hangin' Tough." 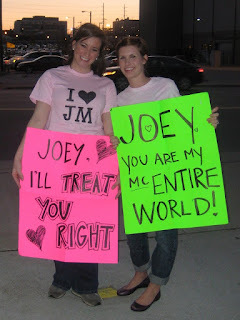 If you were a NKOTB fan and they are coming to/near your city, you HAVE to go! Tickets were not that expensive and it is so much fun. I haven't screamed that much at a concert EVER. Not even at JT. And now, the pictures and videos! Little Joey Mac sings the bridge for "Call It What You Want"
The best video ever - the boys do their signature dance to "Right Stuff"
Joey hits his knees for "Please Don't Go Girl"
Hey Donnie! Wonder if he saw our posters. This one is for my sister - Shirtless Jordan, "Baby I Believe In You"
"I'll Be Loving You Forever"
Now we are both hangin' tough! Look where Allison and I went today! There is a Pinkberry Krave in Green Hills. I had no idea. 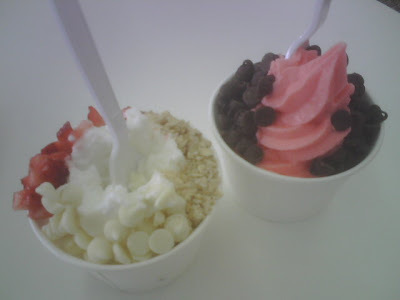 I got original yogurt with white chocolate chips, strawberries and granola for $3.99. Allison got pomegranate yogurt with chocolate chips. I will be coming here a lot as it warms up/when I find myself in Green Hills. *Did you watch SNL last night? I am watching it right now on Tivo and don't think for one second I didn't recognize John Cena in the opening monologue. Did you? *Confession: I stole bacon this weekend... from a toddler.... TWICE. I could eat bacon ALL. DAY. LONG. If I could marry a meat, it would be chicken; but I would have a crazy fling with some BACON. It's just so good. Yum. *Allison is here! Well, not just yet but she is on her way. I am off work tomorrow so we can go play and then tomorrow night, we have a date with these lovely gentlemen. It is going to be amazing. Who knows, there may even be some impromptu tap dancing. *Hope you all had a great weekend! Clearly, He's Just Not That Into You. This birthday post is a very special one for a very special girl. It is my absolute pride to get to tell you about one of my best friends in the whole wide world. Kathryn dear, this one's for you. I met Kathryn sometime back in kindergarten. Growing up we were... how shall I put it... NOT friends. We just had different groups of friends. Not to mention that I spent the majority of my childhood jealous of Kathryn and her adorable dimples and long ponytail. 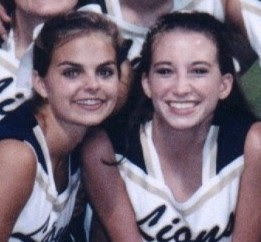 Things really got out of hand in junior high when we were on the same cheerleading squad. I was the captain our eighth grade year, and a bad one at that, but I had good intentions. Kathryn did not. There were more than a few mild sabotoge attempts. And to make matters worse, we liked the same boy and of course he went after Kathryn. I remember having to mask my pure glee the day I came back to school from an orthodontist appointment and Kathryn met me at my locker to inform me that they had broken up and I could be the one to decorate his locker on gamedays now. For her 23rd birthday, I finally gave Kathryn the spirit stick our squad won in eighth grade. It's hanging over her mantle to this day. Our freshman year, we found ourselves in the same English class and with boyfriends who were both on the golf team. The English teacher was also the golf coach, as it were, so occasionally the three of us would talk golf. Around the same time, cheerleading tryouts came back around and we were both made the same squad for our tenth grade year. That and golf got us talking more and more during class and even though golf boy and I broke up, mine and Kathryn's friendship remained. Senior year cheerleading - so much fun! Tenth grade was fun but the really good times started the next year when we were Varsity cheerleaders together. What a fun bunch. Kathryn and I were in the same stunt group so we got close in more ways than one. I have LITERALLY been supporting you for a full decade now, Kathryn! We graduated and went separate ways but remained close. I remember the trip home when I brought my new boyfriend and we went out to eat with Kathryn, and she was telling me about her love life woes. Sometimes the hardest thing and the right thing are the same thing, and in this case, it was definitely true. Within no time, Michael came along, and after meeting him and getting to know him, I knew he was the one for little Miss Kathryn. Knowing such, I made her promise me that when Michael finally asked her to marry him, she would call me no matter what day or time. So when my phone rang one Friday night at midnight during my last semester at Auburn, and the caller ID said Kathryn, I knew what she was calling to tell me. Her wedding was so special and it was a joy to be in it. The same promise extended to when the time came to tell me the stork would be visiting her house. So, once again, when my phone rang twice on a rainy Thursday night this past November, and the caller ID said Kathryn, I knew what she was going to say. Kathryn - and anyone who knows her will agree with me - is one of the kindest people you'll ever meet (unless you met her in junior high). She has SUCH a good heart. She wants to do good and be good and wants good things for others. She is also a very compassionate person. 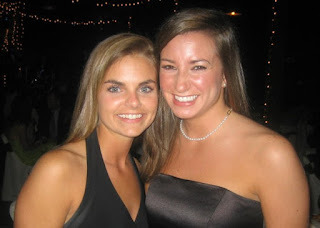 When I moved home to Birmingham from college and life was tough, Kathryn was such a compassionate friend to me, making time to hang out in between planning her wedding and helping with her sister's wedding and job hunting and family issues and everything else she had going on. Kathryn has had to persevere through so much. She is definitely one of the bravest and strongest people I've known, ever. Sweet friend - "I just want you to know... that I love you!" I can't imagine what life would be like without your friendship. It has been nothing short of a privilege to be your friend the past 11 years. When I moved away I was so scared I would lose touch with a few people, chiefly you, and while we don't talk every day, I know that I can call you up at a moment's notice about anything and to me, that means nothing has changed. Highs, lows, tears, laughter - you've been there for me through it all and I hope you know how grateful I am for every minute, every call, every time. I think I knew I had found a true friend in you our sophomore year, when you let me spend the night at your house while my "boyfriend" was at the junior-senior prom social. Anyone who would patiently listen to me gush about a boy that even didn't take me to the prom and not slap me until her hand hurt is definitely a friend worth keeping. I am so thrilled for all the good things happening in your life - particularly little baby Katelyn. You deserve a lifetime of happiness and I hope if there is ever a way I can contribute to that, you will call on me. I love you so much! Man. That was a tough run yesterday. I was mentally there: I took my ibuprofen, iPod was charged, playlist was updated, snack was eaten. But one mile in there is this HUGE hill. Looking back I probably should have saved my energy and not ran the whole thing. Actually I'm not sure if it would have done a ton of good. Oh well. I took a few walksies (my term for when I have to stop and walk) but finished pretty strong for my first time out in a while, or so I thought. I love running greenways. Nashville has several, if you're interested. So pretty. But tough. My goal is to get back up to at least 10 miles a week. I am training for a different purpose. Last year it was for distance, so I'd do 3-4 miles one day then 8 or 9 another day. Eventually, the shorter runs got hard because my body started warming up slower/conserving energy in anticipation for more mileage. This spring, I want to build endurance to knock back 3 miles with no trouble, with 5 or 6 miles being a hard run; or in non-runner speak, I want my body to be wired so the shorter runs will be a breeze (kind of a stretch in summer heat) and the longer ones will be the exception. Also, when the 3-4 milers got easy is when the weight started coming off last year, so that's also part of this year's plan. Unfortunately, the nice weather is already gone. Today it's rainy and gross and there's a chance of snow tomorrow. I stopped and got a fountain Dr. Pepper on my way back from lunch as a treat. Hope everyone is having a good week! 1. Babies - not my own. Three ladies I admire very much are having babies soon. C's sister-in-law will have a baby boy any day now and we're all excited! Katie is having a little girl soon and this will be the first of my very best friends to have a child. And in a few months, Kathryn's little girl will be here in July! Babies, babies everywhere! 2. New Kids on the Block - next Monday! And the cherry on top is that Allison is coming back to town to go with me! Woohoo! I don't know what I am more excited about - NKOTB or ABC. 3. Weather - it's lovely here. I've got a bag packed in my car to go for an after-work run with C alongside this lovely little river, a course that I ran a lot during my training last year. Then we're GRILLING OUT afterward! I know, right? Best night ever. 4. I just ate a pink starburst. YUM! 1. The Album Only option on iTunes - Normally this wouldn't be such a peeve, after all, we have spent years buying albums in their entirety. But iTunes was created so we could pick and choose which songs we wanted, and when a SOUNDTRACK is available all-or-nothing, it really irritates me. Artists are welcome to make their album available only in one purchase. I see the point and wouldn't really blame you. But Confessions of a Shopaholic Soundtrack, you are not the creative masterpiece that you think you are and I am really angry that I can't just buy one song. Either get thyself off iTunes, or make your songs - all of which are performed by different artists - available individually. Thanks. 2. Talking Fish - This new McDonald's commercial where the singing fish starts asking for the filet of fish back has really got me going. It's just creepy. I officially hate all singing/talking fish plaques and also officially hate that song. Please take it off the air immediately, McDonald's, and in its place, may I suggest you run JT's "I'm loving it" ads instead? 3. And speaking of creepy - Submarines. Yes, submarines have somehow found their way onto my list of pet peeves. Last night, C and I went to see The Curious Case of Benjamin Button and that scene when BB sees a submarine is still haunting me a good 18 hours later (side note: the movie was fantastic). But back to subs. These vessels just sit in the ocean like God-forsaken eels and then pop up, survey the scene, and disappear again, all mysterious and lurky. I don't think submarines can be trusted. It's just such a weird concept. Let's live in a tank under the water? No thanks. Submarines, consider yourselves warned. 1. I am digging this sassy top from the Gap. 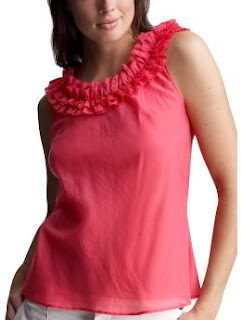 I love spring/summer clothes, particularly those with ruffles. After organizing my closet a little bit last night, I can't say with confidence that I see an immediate need for this top other than I don't have one like it. It also comes in grey and navy. 2. Going to see Confessions of a Shopaholic tomorrow! With MB! 3. Don't even get me started on Ameriscam Idol. Ricky was ROBBED, I tell you. Robbed of audition coverage, robbed of a spot in the Top 12... Grr. 4. Would anyone like to join me in a dayventure to Atlanta? Particularly to Ikea? 5. This seemed like the longest week ever. And the worst post ever. Sorry. Go back and reread the ones from this week. They were pretty funny. Congrats Nashville: we're a manly city. A study came out today ranking the 50 largest cities in America in order of manliness. Who knew that apparently having too many home furnishing stores like Ikea in your city is a sign of being "unmanly." The study looked at criteria including the number of professional major league sports teams, popularity of tools and hardware and frequency of monster truck rallies. And lucky Nashville, we came out on top. Putting us over the edge were the abundance of NASCAR enthusiasts, popularity of hunting and fishing, and concentration of barbecue restaurants. See Clay and Wes? You would TOTALLY fit in here. Funnily enough, cities lost points for "emasculating" characteristics like the abundance of home furnishing stores, high minivan sales and subscription rates to beauty magazines. Rounding out the top five were: Charlotte, Oklahoma City, Cincinnati, and Denver. Memphis came in 11th. Birmingham was 23rd and Atlanta 32nd. San Francisco was 48th.... ha. Go figure that San Fransisco isn't very manly. And it should come as no surprise that the bottom two finishers were New York City and Tuscaloosa, AL. For the rest of the list, click here. PS - I'm kidding about Tuscaloosa. Or am I? Tuesday evening, I came home fully expecting the best part of my night to consist of watching American Idol. Little did I know what was waiting in my mailbox. I had a big old envelope from Neilsen. You may remember they sent me some cash and survey back in January. I filled it out and sent it back, thinking it was the least I could do since, after all, they had paid me. So I open up this big envelope and the first thing that tumbles out? $30. A $20 and a $10. Neilsen, are you MADE of money? You must be if you're sending wads of it all over the country hoping people will fill out your TV diary. I immediately put the money in my purse. I don't mind filling out a TV diary. I only watch four channels so it shouldn't be too hard: NBC in the morning, one of the big four in the evening. Pretty easy $30, if you ask me. How long do I have to wait until I am eligible for them to randomly pick me again? I already spent some of my fortune. I decided to share the wealth with C and paid for our tickets to see Slumdog Millionaire last night, which by the way is a great movie, if you are the last person on earth who hasn't seen it. And speaking of great things to watch - Ricky Braddy tonight on American Idol. He can't seem to catch a break on this show but I promise you if he doesn't make it into the Top 12 via WildCard, it won't be because he didn't sing his heart out. Tune in tonight and see if I'm wrong. And speaking of wrong... Tatiana? SERIOUSLY? Apparently last week's revelation that I lived in the dorm "residence hall" for four years (and one summer) surprised a few of you. I think the dorms got a bad rap. They really weren't that bad. Amazing? Palatial? Spacious? No. But when I pledged my sorority, living in the dorms was the thing to do. Plenty of people who weren't officers lived on the hall. But unfortunately, when I graduated, finding people to fill the hall was like pulling teeth. 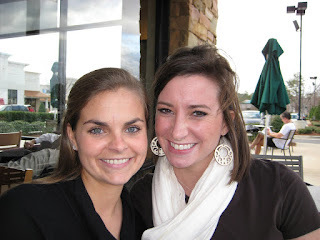 My sophomore year, I lived with Melinda (the one that went on to become Miss Alabama) in the sorority dorm. She and I had tons of fun, only a few fights, and got along great with our potluck suitemates. I have plenty of funny stories about living with her, including one about the time she woke up because she had a bad dream and wanted to talk about theology and demons at 3 in the morning, but that story warrants its own post and/or permission to tell it. Living in the sorority dorm was great. My junior year, I braved the foursome setup for the first time. Me, Lindsey, Susanna/"Susan" (another funny story) and Anna had our twin beds in one room (neatly bunked for half the year, unbunked and resembling an orphanage for the other half) and our desks, "kitchen", futon, etc. in the other. It was crowded to say the least but we made it work. The last day of the spring semester, I moved all my stuff down to the Quad for CWE. We were required to live in the dorms during camp sessions but the majority of us just stayed there regardless. That's the summer that I lived with JB and became best friends with her and a good group of other people. It was a great summer. My senior year, Katie and I lived together. Our second day in the dorm (during rush), she announced her engagement. 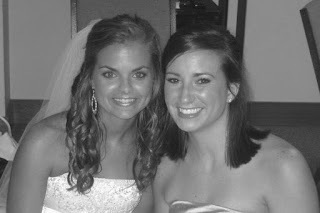 So, after the fall semester, she moved up to Birmingham do her student teaching and finish planning her wedding. Also doing her student teaching? One of our suitemates, and our other suitemate was doing an accounting internship or something so she moved out too. We went from 4 to 1. I was sad to be left all alone, but after I moved the extra furniture into that empty room and realized I had a room all to myself and enough empty space to do a cartwheel (okay, a forward roll at best), I felt like I'd won the lottery. And there were still plenty of people around. I had one final semester left and lived off campus for the first time ever with Haley, Haley and Elisa. I liked it but at the same time, I didn't. I didn't like driving to campus but it was nice to experience Auburn with a different view than from Berta Dunn. So all of that to say, I loved the dorm. It had definite lows, but the highs far outweighed the lows. There were always people to prank or go to the store with. There were always movies to borrow (or for some people, to steal). We had a copier on the hall which came in handy so often. We would all crowd in one room to watch TV shows, like the Bachelor (way back when it was good). I know a lot of you reading this lived in the dorms, most of you in the same dorm as me! What are your favorite dorm memories? The tornado drill in the middle of the night when our RA wasn't even there? Piling all the move-in day trash outside of some innocent sophomores's suite? Do tell. As I mentioned, I made my first trip to the Opry this weekend. It's funny how living in a city where there is so many different cultural experiences to be had, I seldomly take them in. Restaurants, music, etc. I need to get out more. So this weekend was my first foray into the tradition known as the Opry. The show is in four segments. Each segment has a "host" - first up was Little Jimmy Dickens, then Marty Stuart led a segment, then Bill Andersen then Ricky Skaggs. 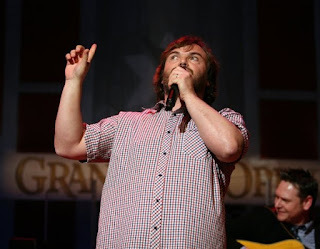 Jack Black was in Ricky Skaggs's session. Jack's father-in-law is a great jazz musician who just released a friends and family bluegrass album. He invited Jack to come perform the song he sang on the album - "Old Joe Clark." What a nut. He bounced all over the stage. I was kind of spellbound by the whole show - this thing has been going on since 1925. It's just so cool that it's still going strong. While the musicians that performed weren't people I would pay to go see by themselves, it was amazing to hear all that different music by such talented people in that legendary place. If you are a Nashvillian and you haven't ever been, you should go! Last night, I decided to wear the hoop earrings C gave me for Christmas to the Grand Ole Opry. More on the Opry tomorrow. This first. So we had a great dinner and walked to the Opry and saw a great show. I had never been before so I enjoyed it. Jack Black - yes, that Jack Black - was funny and when we left a 11:30, it was snowing hard. 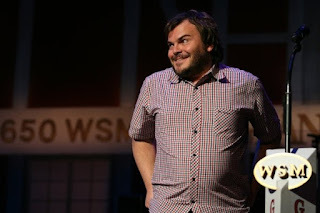 Jack Black on the Opry and thick snow in Nashville - already a weird night. We hurried back to the car, which was about a two block walk, knocked some of the snow off and went back to my apartment. It was in the parking lot that I noticed one of my hoops was missing. I freaked out to the point of tears. I looked on the ground, in the car, in my pockets. You know how you check the same place two or three times knowing it's not there but hoping it will just magically appear? That was me. If you know me well then you know why I decided at midnight to conquer snow and crowds in order to find this hoop earring. I sent C on his way and headed toward the parking lot where we'd left the car. I was trying to decide how much time I would devote to this search and rescue when I pulled up to the parking lot. I put the flashers on, jumped out and was heading to the place where we'd parked the car when I saw a lone silver hoop lying on the pavement, waiting for me to come and retrieve it. Now what are the odds that I would find it? Such a strange night.